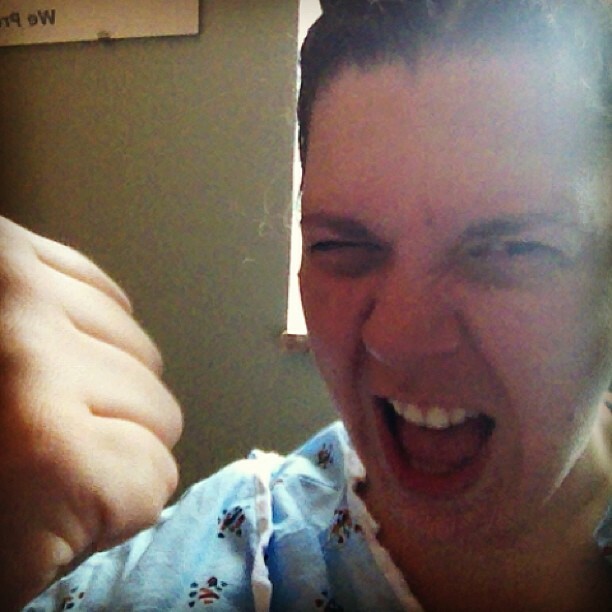 The continuing story of my recent hospitalization and health scare. Part I is here. Part II is here. Let’s do a thought experiment for a moment. Say you are a health care provider, and you have a patient who just faced a life-threatening episode like… oh… let’s say a pulmonary embolism. She is in the hospital, and has been there for four days – one of those days in Intensive Care. Her case has been discussed in detail by a team of lung and heart doctors, all of whom have come to consensus on her treatment plan. She is currently in the Telemetry Unit, where she is being monitored very closely and is getting consistent tests and medication. a) Keep monitoring her carefully to ensure that she returns to health as smoothly as possible, under the watchful eye of a medical team that knows all the details of her case. b) Transfer her to a different hospital on the opposite side of the city where she has never been, and give her over to an entirely new set of medical professionals who don’t know her case at all, and could dramatically change her treatment plan if they wanted. If you answered “b,” then you likely work for my insurance company. The great thing about HMOs is that they cover a larger percentage of your medical bill, and they are a bit cheaper than PPOs. I am all for both of those things. The downside is that in order for them to cover you – you have to remain in-network. When I collapsed, I really didn’t have a choice to go to an in-network hospital. The paramedics took me to the closest one, which happened to be St. Francis. My insurance company is cool with that. If it’s an emergency and you’re admitted, there’s not a whole lot they can do. They’ll cover it, even if it’s out of network. But… my stay got longer and longer as my blood refused to get thinner. And once I was stable enough, the case manager at my insurance company started to insist that I get moved to an in-network hospital, despite the fact that the doctors at St. Francis understood my case intimately. I was furious. And that didn’t help my blood pressure, or my ability to recover smoothly. I was assigned a social worker, who rocked the house. She did everything she possibly could to try and convince the insurance case manager that I shouldn’t be transferred. She offered all kinds of options, including one of the more common ones — discharge me and let me be at home and be monitored by home health care nurses. I would have to give myself subcutaneous shots twice a day, but that would be small change compared to having to go to a completely new hospital with a completely new treatment team. The case manager was having none of it. My social worker was at her wit’s end. She told me several times that she had never experienced this level of pushback from anyone before. I got more and more disheartened as the battle continued. Finally, my social worker had to give in to the insurance company demands, and I was scheduled to be transferred as soon as a bed at the other hospital opened up. Why don’t I have my HMO set up with the hospital that is closest to my house, you ask? My gynecologist recently changed networks, and she was fixing another problem I was having by means of the birth control pills. I really like her, so I wanted to follow her. I hadn’t set up my new primary care doc yet – which is something I now realize I should have done immediately after changing networks. (You may recall that I have been somewhat lackadaisical about my health care up to this point. No longer.) Now, those birth control pills are trying to kill me – and I am looking at recovery maintenance with a doctor I have never met. I don’t anticipate it will be too much of a problem once I can get situated, but it’s a level of stress I really didn’t need. Once September 1 rolls around, I can change my primary care doc back to the ones who know my case – so I only have a few weeks to juggle things around. So for about 3 days, I was on edge, wondering when the dreaded call would come in from the other hospital saying that they had a bed open. It was entirely possible that they could call at 3am, and the ambulance would come for me in the middle of the night. The folks at St. Francis thought it was ridiculous, but they were ready to comply for fear that my insurance company may not pay my bills otherwise. I mentioned in an earlier post that I went without health insurance for many years. I have lived in Chicago for about 12 years now, and I would say that I have only been covered about 4-5 of those years. I can’t say that I enjoyed not having benefits, but as a reasonably healthy young adult, it seemed risky, but not fatal. Now that I am looking 40 in the face — I may hate my job, but I am very, very glad that I have health coverage. My boss may be crazy, but she also has these moments of pure, jaw-dropping generosity … and she is paying me for the time I have been off. Considering I am still not back at the office and am somewhat in limbo about when I will return – that is a huge gift that I will not take for granted. So while the insurance debacle was a huge source of stress during my final days in the hospital, I am also aware of what a major privilege it is to have it. I can’t begin to imagine what I would be going through now if I had to face those bills. I don’t even want to contemplate it. Coming soon: The road to recovery and thoughts toward my future. This entry was posted in The Great Health Scare of 2013 and tagged blood clots, hmo, hospital, insurance by River. Bookmark the permalink. I’m only just now getting the full scope of what happened and I’m sitting in a waiting room crying while I read this. I can’t imagine going through this. You are hella strong. Love you!